More and more, customers are reaching out to businesses on Twitter. From asking for store hours to reporting a service issue to troubleshooting a technical difficulty, Twitter provides the right channels (both public and private) to help people solve everyday challenges. Several recent improvements to Direct Messages in particular have helped to better facilitate the private side of the business-consumer conversation, and Sprout Social has been quick to incorporate these updates. Today, as we continue building upon these enhancements, we are excited to provide an even better experience for our customers. Because of our deepened partnership, Sprout is one of the first Twitter Official Partners with access to new functionality for attaching images to Direct Messages. When troubleshooting a technical issue, customers can safely share screenshots that may contain personal or confidential account information. Social customer support agents can save time by attaching a visual asset, such as a step-by-step tutorial, to their DMs rather than transcribing instructions as text only. A brand can demonstrate personality in the same way it might on a public Tweet by including a lighthearted image after resolving an issue. 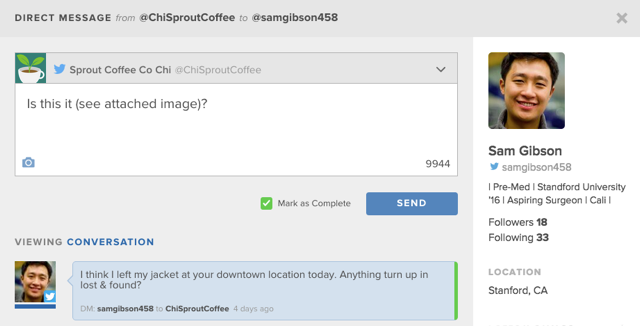 Attaching an image to a Direct Message from Sprout is easy. Whether replying to a DM from the Smart Inbox or initiating a conversation, simply click the camera icon in the lower left of the compose box, then upload your file. What’s more, as an increasingly important backchannel, Twitter DMs empower businesses to meet growing customer expectations with a tailored, one-to-one experience. In doing so, Twitter not only offers businesses a platform to deliver exceptional social customer service, but it also can enhance operational efficiency to save time and money. As Twitter expands upon its platform, Sprout will continue working closely with the company to incorporate any new features in a timely manner. This will ensure you have the most up-to-date and powerful set of tools to communicate as openly and as effectively as possible with your customers.